All of the DVDs are created by Ross Thorne. Most deal with architectural and social issues of cinema and capture a sense of "then" and "now" through a combination of new video interviews, archival photos and detailed studies of the buildings and towns as they now stand. For copies of any of the DVDs please contact the National Film and Sound Archive. "Whatever Happened to My Local Picture Theatre? (2012)" is a rather indigestible resume of what happened to the picture theatres in some 40 out of 289 towns in country New South Wales that had a picture theatre in 1951. It summarises the demolished buildings, those that have returned to being community halls, those used for other uses (such as supermarkets), and the very few that have been saved. Duration: 57 mins; PAL; 16:9 aspect ratio. 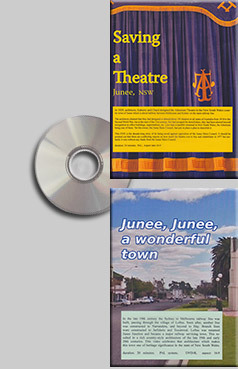 "Saving a Theatre" and "Junee, Junee, a wonderful town"
Saving a Theatre (24 minutes) is the ten-year long ‘history’ of ‘saving’ the Athenium Theatre, Junee. The local Council that owned it wished to have it demolished, but there was enough community concern to alert the NSW Heritage Council to go through the process of heritage assessment and listing as an item of State significance. The video uses documents from the local council, newspapers and Government to illustrate the difficulties experienced. Junee, Junee, a wonderful town (20 minutes) shows how many heritage buildings, apart from the theatre, that exist in this ‘off-the-beaten-track’ railway township. It is noted for a 19th century railway station and functional full-circle engine roundhouse now used as workshop and museum. 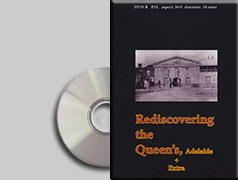 "Rediscovering The Queens Theatre, Adelaide - plus Extra (2013)"
This is the film-makers’ personal story of involvement in the history of this theatre, built in the embryonic Adelaide town of 1841. It relates the early research, the archaeology carried out by Justin McCarthy in 1989, and the 1994 archaeology funded by a small Commonwealth Research Grant. It shows the restored facade and the remnants of the former 1841 auditorium that is now used for performances. The Extra is the full on-camera description of Justin McCarthy’s 1994 archaeological ‘dig’ in his own words. 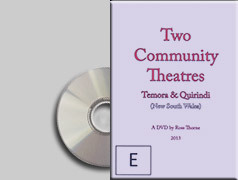 "Two Community Theatres: Temora & Quirindi (2013)"
Two case studies are on this DVD as derived from interviews with those responsible. Temora’s Town Hall Theatre is a new small cinema-theatre built within the walls of an existing building. The interviewee, manager Beth Firman, describes how the theatre was initiated, its operation and its success. Quirindi’s Royal Theatre, built in 1930, was purchased by the Liverpool Plains Shire Council in 2008. With a speedily built upgrade with air-conditioning and digital projection, the Royal is used for cinema and live shows on-stage. It is operated by volunteers, two of whom are interviewed together with the Council’s Development Officer. Duration: 33 mins; PAL; 16:9 aspect ratio. 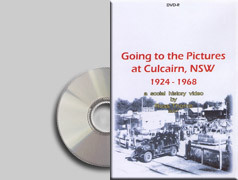 "Going to the Pictures at Culcairn NSW 1924-1968" a community hall that doubles as the only cinema in town is the focus of this video. It uses recollections of local residents and video material of the building as it now stands, including a film rewinding room almost untouched from the 1950's. 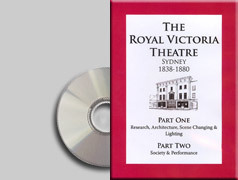 "The Royal Victoria Theatre, Sydney, 1836-1880" is an award winning documentary series from 1992 using recreations of 19th century performance and staging techniques. The series was originally produced by the University of Sydney and their participation in this re release is greatly appreciated. 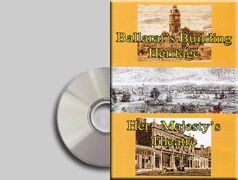 "Ballarat Building Heritage" and "Her Majesty's Theatre" explores Ballarat's impressive Victorian streets and the interiors and back stage areas of the restored Her Majesty's Theatre. 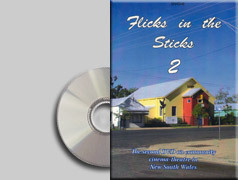 "Flicks in the Sticks 2" (2009) returns to the original NSW Government Initiative on Country Cinema and follows, through the different efforts at Nundle, Coonabarabran, Gunnedah, Bowraville and Gulargambone, how cinema was revived in those communities in NSW. It also includes the purchase and conversion of an old cinema in Balranald for community, social and performance use. "Flicks in the Sticks" features a number of community run cinemas in country towns across NSW. The common thread is that each one is each run under a different management model with varying degrees of community involvement and diverse uses. The video is an insight into the way community groups have successfully established a community run cinema in small towns where a commercially run cinema is no longer viable. The featured locations are the Montreal in Tumut; the Roxy in Bingara; The James in Dungog and the Roxy in Leeton. 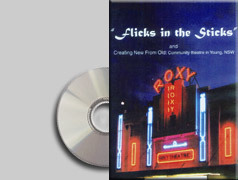 Also on this disc is an introduction to the topic of cinema heritage recorded at the 'Flicks in the Sticks' seminar held at the Amusu theatre in Manildra NSW in 2001. 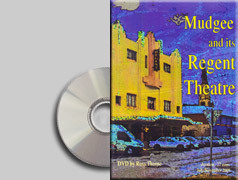 "Mudgee and its Regent Theatre" (2009) provides a visual description of the town, and its cinematic history, culminating in an exploration of the Regent Theatre that was closed and up for sale in 2009. The video was shot during a special festival of films as a way of promoting the sale. 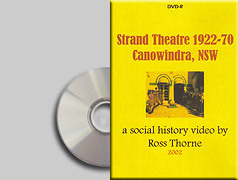 "Strand Theatre 1922-70 Canowindra, NSW" (2002) is a social history video based on interviews with elderly townsfolk, plus a walk through the projection box that had been disused for over thirty years. 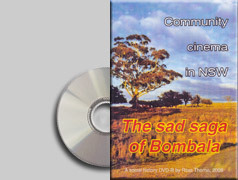 "The Sad Saga of Bombala" (2008) is a social history of how a community group started a community cinema in the old Olympia Theatre, but was defeated by a combination of the 2002 insurance crisis in Australia and petty local bureaucracy. Extras include the full interviews at the old Olympia, features of its functioning projection box, and in the former historic Literary Institute hall, the planned site for the community's second attempte to establish a permanent cinema. 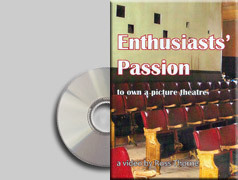 "Enthusiasts’ Passion to own a picture theatre" (2010) traces three enthusiasts who wanted to own a cinema. Chris Gray bought the former Plaza Theatre at Coonamble and has been restoring it how he remembered it when a teenager. John Mitchell bought the Royal Theatre, Quirindi, since he loved projecting films. He and a friend restored it and filled it with a unique collection of 35mm film projectors before selling it to the Liverpool Plains Shire Council to be run as a community venue. Andrew Sharpe made an 80 seat-cinema/performance space wihtin the old billiard room of decomissioned hotel in Barraba where he continues to provide weekly film screenings and ocassional live shows. 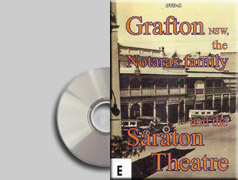 "Grafton NSW, the Notaras Family and the Saraton Theatre" (2011) starts with the Notaras family coming to Grafton in 1909, building the Saraton Theatre in 1926, modernising it in 1940, being heritage listed in 2000, and finally restoring it with the addition of two new screens in 2010 (being fully digital in projection). Interviews are with two elderly members of the Notaras family who have been responsible for the rehabilitation of the theatre.